We have been invited to participate in Season 6 of the Mafia Championship! 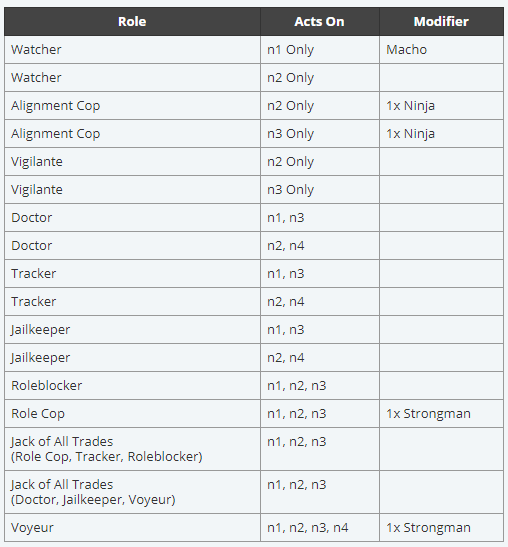 Each of the following 17 roles will be assigned at random to one player in the game without regard for the player’s alignment. Each role is restricted to using its action only on the nights listed on the chart. Role reveals at death are alignment only. You will not learn a player’s exact role when they die. Majority is not in effect. Votes are automatically locked in at LYLO. Mafia factional kills are assigned. They can be tracked, watched, or roleblocked. Mafia share a factional Night Kill, which is a single standard shot for their faction. Mafia members may perform the faction kill in addition to their regular action at the same time. Mafia may communicate at any time. Tied votes will result in a player being lynched at random from among the tied players. Each individual player may make a maximum of 200 posts per day phase (this restriction is lifted 2 hours before day end). The game will have a host to oversee everything and make sure everyone’s following the code of conduct, but otherwise the game is completely automated (automatic votecounts, thread locks and reveals roles automatically, the bot receives and processes actions, etc.). What is the Mafia Championship? The Mafia Championship is a cross-community event pulling hundreds of players from various Forum Mafia communities to determine the “best FM player of the year”. It blends the competitive nature of the game with the networking opportunities granted by such an expansive experience, allowing people to make new friends and meet new communities through the world’s largest Forum Mafia event. Players of all sorts from all kinds of sites are able to play with each other to learn from each other and strive to win the title of Champion. What is the tournament setup? Each community picks one representative to send. All games are played on Mafia Universe, and will be moderated automatically by a bot. There are qualifier games, each with different day and night lengths, throughout the months of April, May, and June, from which a player voted as the MVP will advance directly to the finals. All runners-up for MVP, as well as 23 other players voted on by a jury, will advance to one of two Wildcard games in July to determine the three MVPs from each game, who will round out the final six slots in the Finals in August or September. After the Finals game has ended, the players vote on a MVP to be crowned the Season 6 Champion. What is the game setup? What does our representative need? First of all, in order to be a representative, you need to be willing to commit to being active in your game/games over the course of the summer. If you do not make the required minimum number of meaningful posts on any given day, you will be removed from the game. Additionally, MU is also a lot stricter than we are here on the rules, so you must commit to reading them, following them, and not discussing the game anywhere with anyone until it is over, no matter how much you think it couldn’t possibly hurt. The invitation cites that representatives should be willing to read around 600 posts per 24 hours, and that those who are not willing/able to do so should consider not applying. Personally, I’ve been in games with a much higher post volume, so although I don’t want to scare anyone away, do be aware that you may end up having to read even more posts per day than that in the early parts of the game. However, our representative is also responsible for choosing which games to apply for. As games start throughout the months of April, May, and June, it is possible to be busy for a sizeable chunk of those months and still participate by choosing an earlier or later starting time. Additionally, the phase lengths of each game may be different - generally, games will run with phases as low as 12-hour days and 12-hour nights to phases as long as 72-hour days and 24-hour nights. Choose whatever you feel most comfortable participating in. Should the Representative be chosen to move on to either a Wildcard game or the Finals, they will need to be available for those as well. The Wildcard games are expected to run in July, while the finals should run in August or September, depending on players’ schedules. Although it is not required, I also encourage anybody who wishes to be our representative to participate in one of the pre-season practice games held on Mafia Universe. Their forum is formatted quite differently than ours, and becoming familiar with the setup and the automoderator will help the transition into the Championship game much easier. It may also be a good idea to play in at least one or two other MU games if there is time before your Championship game, to continue building a feel for the site and its meta. How will we choose a representative? Because I have done all of this before, am currently the de facto liason to other communities, and was the one who contacted MU to apply for an invite for CD, I will be running the process of selecting a representative. However, it will be an entirely democratic process. All nominations must be submitted directly to me via Private Message. The nominating player must have been a participant in at least one game of FRC Mafia. The full list of FRC Mafia games may be found here. The nominated player must have participated in at least one completed (non-canned) game of FRC Mafia. They do not need to have been the victor of a game. You may nominate no more than two players. You may discuss nominations with others here or elsewhere, but are not required to disclose who you are nominating if you do not wish to. I will hold on to my two nominations, and may nominate anybody I feel deserves a nomination after the other, private nominations have all been submitted. Once all nominations have been submitted, those nominated will be revealed and may accept their nominations. There is no advantage to receiving multiple nominations. Once nominations have been revealed, all nominated players will have until 2019-04-08T03:59:00Z to either accept or deny their nomination. There is no shame in denying a nomination, and may be done if you will be unable to participate in the championships or do not wish to for any reason. After all candidates have accepted or denied their nominations, voting will begin. The way voting occurs will be based on the number of players that accepted nominations. The exact method is subject to change up until voting starts, but I anticipate there will be two rounds of voting. During the first round, you will likely be able to vote for as many players as you would support to be our representative. The top players from this vote will move on to the second round, which will run on a different voting method that ultimately leaves only one representative (either FPTP or STV, dependent on the number of players left at this stage). More details on this will be given next weekend. The chosen representative will represent Chief Delphi in Season 6 of the MafiaUniverse Championships. Whoever comes in second place in voting may choose to take the place of our Backup Representative. If our Representative must drop out for any reason, the Backup Representative will take their place in the Mafia Championship. Much like nominations, the spot of Backup Representative may be denied by a player for any reason. If this occurs, the third place player will be offered the spot, and so on. If I’m not the Representative, how can I participate? There will likely be a spectator Discord set up, where you may discuss the games with other players if you wish. Additionally, I believe that the pre-Season practice games will be open to any player that wishes to participate, so don’t be afraid to make an account on Mafia Universe and join in to get a taste for the setup this year. The Championship is a great time to meet other players on other sites and improve as a Mafia player. This is amazing!!! I’m so exited for however gets sent! personally, I think @brandn03 is a good candidate as they were amazing in the last game faking being town. I’m not sure I’m up for that type of commitment. I’ll be vacationing a lot during that time frame and spending time with the family after robotics season. I know! Let’s nominate @EricKline! Dunno what my schedule is like tho. I’m really only saying this because it’s apparently a requirement for me to be able to finally prove @orangeandblack5 is mafia. I think I was complaining about it in either FRC M3 or FRC M4.